The school days are almost upon us! NYC Public schools start next week, and while Aria is super excited about going to school, she also insists she wants to go back to her old school “with Miss. Lyra and Emy”. Last year Aria attended the MAP (Music, Art & Play) at Greenwich Music house in the West Village. We had done the whole Nursery School application routine (alright, only really one place), but in the end decided on Greenwich Music House. In retrospect, I think it was one of the best things we could have done for her, and the program is definitely a hidden gem for west village parents. 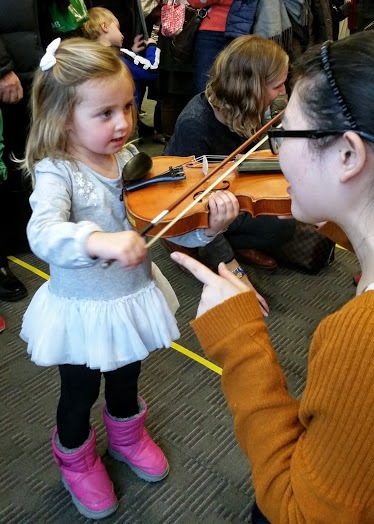 Greenwich Music house offers a variety of programs for all ages, but the MAP program is perfect for 3 year olds, providing just what they need at that age. Art, music and play suits their age perfectly, stimulating their senses and creativity, but not overwhelming them (and it’s FUN — social skills develop too!). We got a great variety of daily art projects sent home, seeing Aria’s creativity bloom (and I’m convinced today she’s such a good drawer in part because of this). We also saw our little one grasp onto music, finding confidence in her voice and embracing all different kinds of instruments and her own musicality. 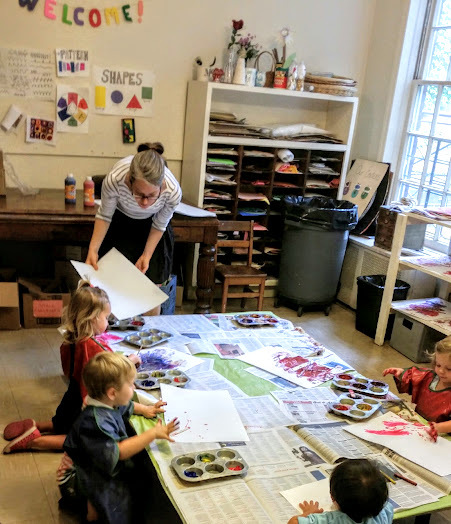 The building is a charming brownstone, a warm loving environment that is safe and contained, and also boasts a sweet outdoor garden for them to play. Many a day, Aria did not want to leave after wrapping up with the daily, “It’s time to go now,” Goodbye Song. Learning also extended beyond the brick and mortar of the school. The kids had a variety of field trips and outings, serving the community with a holiday sing-along at a local senior center, and taking advantage of the cultural playground that is NYC (see photo from a Very Young People’s concert at Merkin Hall). Finally, and most importantly, the teachers are WONDERFUL. I can’t say enough good things about their care, which definitely eases an anxious parent who may be leaving their child in another’s care for the first time. Both Ms. Lyra and Ms. Emy are extremely capable, loving and caring, and very communicative with parents– providing email newsletters on what the little ones are up to, and always being open and welcoming to all. Our last snowy pic of 2015 by the amazing Ana Photo! It seems unbelievable that just a week ago we were taking snowy pictures with the amazing Ana Schechter. It feels like Spring is finally on the horizon now. We hit the playground for the first time this week, and despite slushy puddles and wet pants and socks by play’s end, it was nice to be out, feel the sun on our face, and feel hopeful that winter (and snow) is just about past! In teaching yoga this week, I’ve been paralleling the natural elements around us, and asking students to consider what we need to let thaw in our own lives. What can we let go of in order to prepare space, and prepare ground where new seeds (and we) can grow? It’s necessary, and worth considering for anyone who wants to bring in the new, fresh and better stuff in life. In a practical sense we’ve also been preparing, thinking about next year and our plans for living in the city (or not). Kelcey Kintner, who I adore and seem to be living a parallel life of some days (minus 4 kids of course), recently wrote about how she lost a piece of herself in leaving NYC (her blog Mama Bird Diaries is a must follow). I’m sure many of us NYC moms battle with the question of going or staying. I know I’ve been for quite some time. For now, we’re still keeping our love (some days hate) affair with NYC going. Pre-K applications open on March 16 for all the NYC moms out there, and I’m hoping the process is not too painful. Apparently, with the new Pre-K for all initiative, there are many more seats available, but it’s still important to get the application in ASAP. So, here’s to Spring and many new things on the horizon. Let the sun shine on your face today, and enjoy it!